e-Science has been greatly enhanced from the developing capability and usability of cyberinfrastructure. 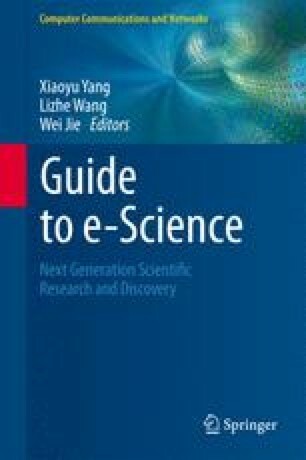 This chapter explains how scientific workflow systems can facilitate e-Science discovery in Grid environments by providing features including scientific process automation, resource consolidation, parallelism, provenance tracking, fault tolerance, and workflow reuse. We first overview the core services to support e-Science discovery. To demonstrate how these services can be seamlessly assembled, an open source scientific workflow system, called Kepler, is integrated into the University of California Grid. This architecture is being applied to a computational enzyme design process, which is a formidable and collaborative problem in computational chemistry that challenges our knowledge of protein chemistry. Our implementation and experiments validate how the Kepler workflow system can make the scientific computation process automated, pipelined, efficient, extensible, stable, and easy-to-use. The authors would like to thank the rest of the Kepler and UC Grid community for their collaboration. We also like to explicitly acknowledge the contribution of Tajendra Vir Singh, Shao-Ching Huang, Sveta Mazurkova, and Paul Weakliem during the UC Grid architecture design phase. This work was supported by NSF SDCI Award OCI-0722079 for Kepler/CORE, NSF CEO:P Award No. DBI 0619060 for REAP, DOE SciDac Award No. DE-FC02-07ER25811 for SDM Center, and UCGRID Project. We also thank the support to the Houk group from NIH-NIGMS and DARPA.